Atherosclerosis is a condition that affects many people, several of whom do not know they have the condition until the effects have started to show consequences to their health. 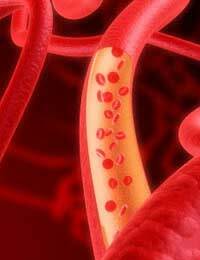 Atherosclerosis is a condition that means the arterial blood vessels have become hardened, inflamed and diseased. This is caused by a build up of debris called atheromas (or plaques) that result from high cholesterol and smoking. The main cause of atheromas developing is because of a build-up of the ‘bad’ type of cholesterol. This causes the body to respond and send other components of blood to the effected area which cannot process the components of the atheroma and causes a greater amount of cholesterol to build-up. Atherosclerosis can have an extremely detrimental effect on health and in some cases even death. Initially the blood vessels will try to accommodate the collection of plaques by enlarging but this scenario cannot continue for long. As the vessel becomes larger, the risks of it rupturing or becoming blocked are increased. This can cause the blood supply to major organs to become severely compromised which can lead to the affected organ’s tissues becoming depleted of oxygen, enzymes and nutrients which puts them at risk of long term damage and prevents them from functioning properly. If the arteries around the heart are affected or the blood supply to the organ is compromised there is a chance that the heart muscle could become oxygen depleted and a myocardial infarction (heart attack) can occur. It is essential that we try and do our best to protect our vascular system and cardiac muscle from long term damage and this is done mainly by making sure we have a healthy lifestyle. A lot of the things we like are unfortunately bad for us but in order to enjoy a long and healthy life, there are things that should be avoided. A diet low in fats and therefore bad cholesterol is essential to prevent the cholesterol from collecting in the arteries. Fortunately there are some products now available that help to lower this type of cholesterol and we should try and incorporate some of these in our diet if we can along with eating plenty of fresh produce as many processed goods contain high levels of fats and salt. Smoking is one of the biggest risk factors associated with this condition (and many others) as the combination of the effects of smoking on blood pressure plus the increase in blood pressure because of the narrowed arteries means the cardiac muscle has to work even harder to keep up with the demands of the body. It is vital that we try to stop smoking and do everything we can to make sure the future generations are dissuaded from trying cigarettes and other tobacco products in their youth which is when most smokers establish the habit. The government is making more steps every year to put people off smoking and are running many schemes for existing smokers offering them help to quit this potentially lethal habit. It is also important that we take regular exercise in order to keep our cardiac function optimal which in turn will help keep blood pressure lower and relieve any extra exertion on the blood vessels. There are so many physical activities available that most people should be able to find an activity that they enjoy doing and will want to find time for. Atherosclerosis is a damaging condition and the effects can cause a lot of distress for both the sufferer and those around them. Prevention of the condition is essential as the effects cannot be reversed entirely and most people are unaware they are at risk until they have suffered some of the consequences.